In a student's world of growing facts and information, we can't expect them to learn more and more and more. We have to help them connect the facts to more enduring concepts and "understandings." By elevating concepts, we give them the conceptual lens for making sense of their world. When we allow them to do this type of thinking, that's when the learning begins to make sense. So, how is Jackie Robinson's history connected to a study of the U.S. Constitution? When students explore the concept of citizenship, students should know civic ideals (including freedom, rule of law, civility, cooperation, respect, responsibility, and civic participation). In terms of skills, students should be able to relate individual and group actions to civic ideals. Finally, taking this factual learning involves helping students to understand that "actions illustrate our commitment to civic ideals" by exploring the essential question, "What are ways people might demonstrate commitment to civic ideals?" Instructionally, our goal is to create learning experiences where students think conceptually and critically analyze (21st century skill) a variety of resources, including primary source documents. What about trying it this way? Present the learning objectives to students. 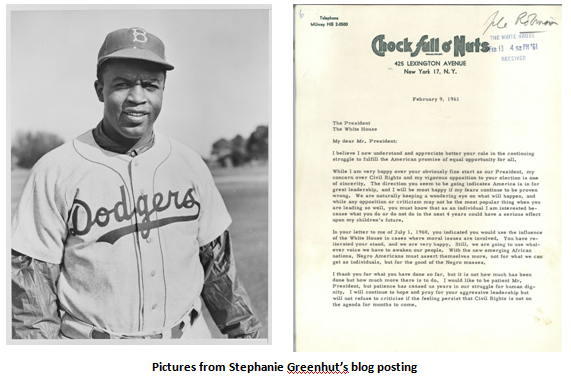 Present a brief biography of Jackie Robinson. Discuss how historians read primary sources critically and ask questions. How do these sources reveal actions of people connected to their beliefs about civic ideals? How are the actions of people, today, similar or different than the actions of the past? Now, how might you answer, "What are ways people might demonstrate commitment to civic ideals?" This type of learning experience involves critical thinking and analysis, primary source analysis (part of the historical process), elevation of what kids should know, elevation of what kids should be able to do, and conceptual connections so students can transfer their learning to a modern context. Give it a shot, let me know what you are thinking about related to civics, backwards design, instructional design, or concept-based instruction? We only grow as teachers if we begin to think AND TEACH in new ways.